We got up shortly after six and started to pack the van for the trip home. We all had a wonderful, non-rushed breakfast together in Scott & Jennifer’s big farmhouse kitchen. There was lots of great coffee, hot chocolate and conversation. The goal was to leave by eight, but by the time we said all of our goodbyes, and had hugs, it was about 8:20 when we started our 1300 km journey home. We drove into Lennoxville and pointed out Bishop’s University to the boys. The older brother of one Alex’s best friends goes to Bishop’s. We crossed the border with no problems and visited the Information Centre to pick up a map of the State. It’s unfortunate that we had to complete such a long drive in one day, because we would have liked to have stopped in many different places along the way. We’ve made notes, in case the Ottawa opportunity comes up again another year. The White Mountains were gorgeous, and we drove past Mt. Washington and Santa’s Village in New Hampshire, both places I remember visiting with my own parents when I was a child. I was glad that Jennifer had sent along those treats for Olivia, as other than the delicious breakfast at their house, the rest of today’s meals were eaten in our van while we were on the move. The kids did remarkably well in the van, especially considering they were on the road for nine hours yesterday and almost fifteen hours today. There was only once, in Maine, when we told Olivia to pick out a house she liked so we would leave her there. She decided that we couldn’t leave her there, because “Pepper” (D’Arcy’s brother’s dog) would miss her. Oh my! We filled up with gas one last time just before we got to Calais. It was only 76 cents per litre there, as opposed to $1.32/L here at home. Our Border crossing back into Canada wasn’t as fun as our first crossing through there two weeks ago. This time, we were flagged for a random check. The Boarder Agent that checked the car was quite nice and I think he realized that we weren’t smuggling anything in to the country. He moved as quickly as possible and let us go. In fact, he allowed the kids to stay in their seats. I’m sure it helped that I had my receipts ready and offered them to him to check. With six of us in the car, and having been in the States for six days last week, we were allowed to bring back $800 worth of goods each, duty free. We’re nowhere even close to that, despite supporting the US Economy in Freeport! After traveling 5,260 km by van in fourteen days; covering three provinces, five states; going from 156 feet underground to 1100 feet above ground; two different subway lines, a commuter train, an amphibious boat, numerous roller-coasters, many kilometers and stairs on foot; numerous shoulder rides, elevator rides, and luggage cart rides; seeing five major waterfalls, exploring twenty major museums and/or historic sites, swimming in pools, waterfalls, and a river; visiting with twenty-five people who are very special to us but we don’t have the opportunity to see often enough; we arrived home just after midnight to a full house at The Belgravia Bed & Breakfast and went right back to work. *This post was written during the 15 hour drive home from Quebec to Nova Scotia on July 15th. 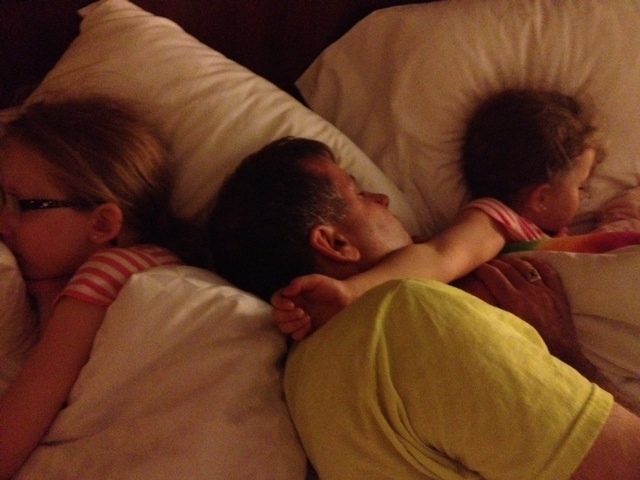 After we got back to the hotel from the Yacht Club, D’Arcy fell asleep while getting the girls settled and I packed up our room. 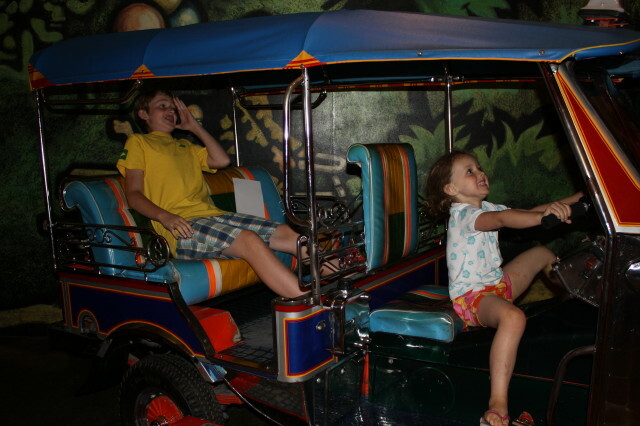 The plan was to pick the boys up from their cousins’ at 8 a.m., but it was just before that time when we left the hotel. 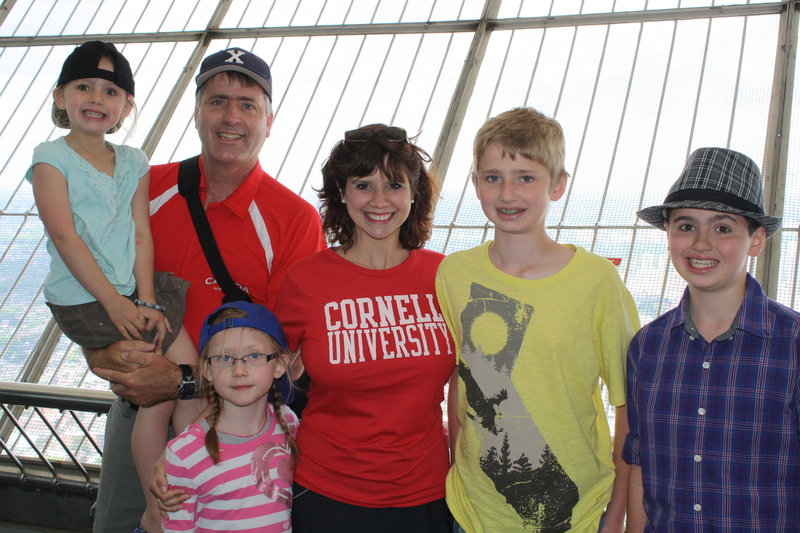 We picked up Evan and Alex, then said good bye to Kathleen, Bill and the kids. It was a really fun visit and we hope that D’Arcy might have the opportunity to come back another year. When Evan was a baby, we lived on the same street as Bill & Kathleen, just two houses apart. 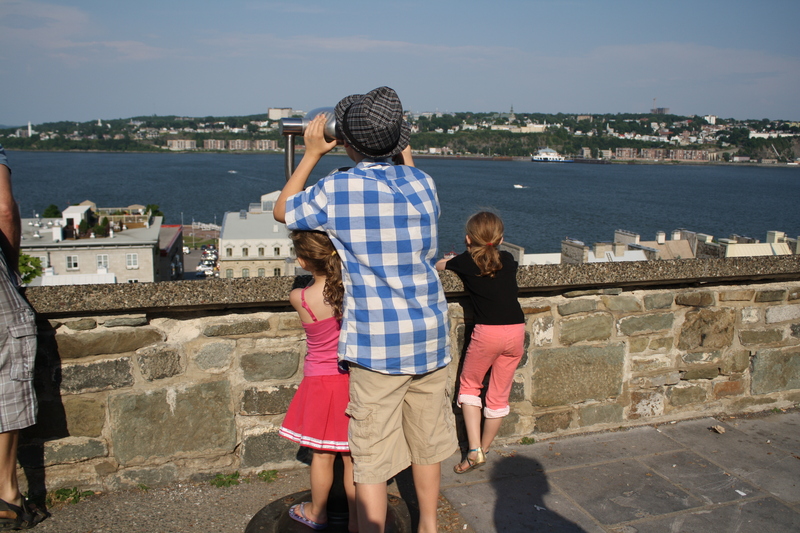 They’ve been in Ottawa for five years now, and although they’ve been home, they usually center their visits in Halifax and we just see them briefly. It was really great to have a chance to reconnect and not be in a rush. 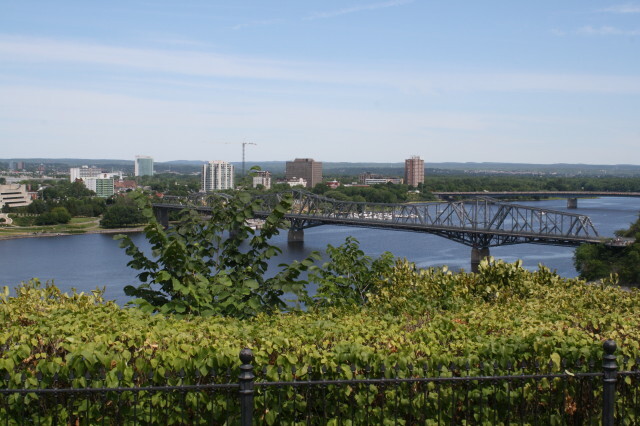 Our plan was to drive straight through from Ottawa to Quebec City, a five hour drive, and then spend the afternoon in Ottawa. 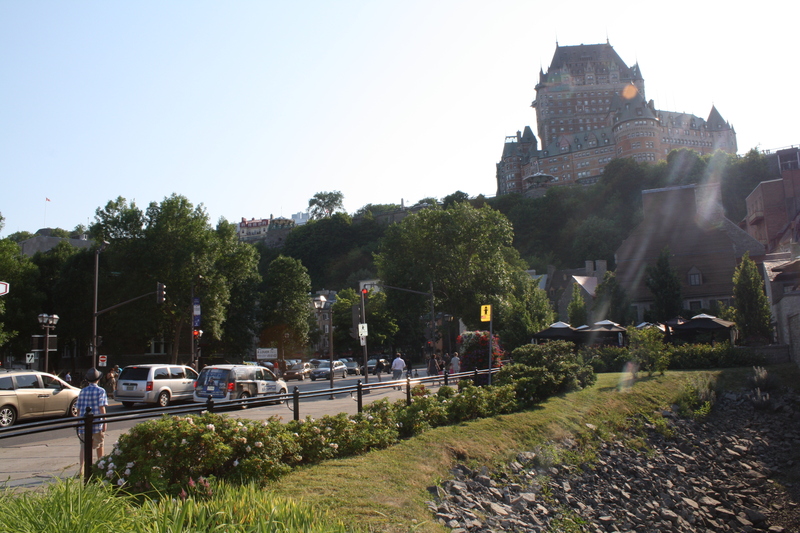 Because of traffic, construction, and two accidents in, and outside of, Montreal, it took us six-and-a-half hours to get to Quebec City. 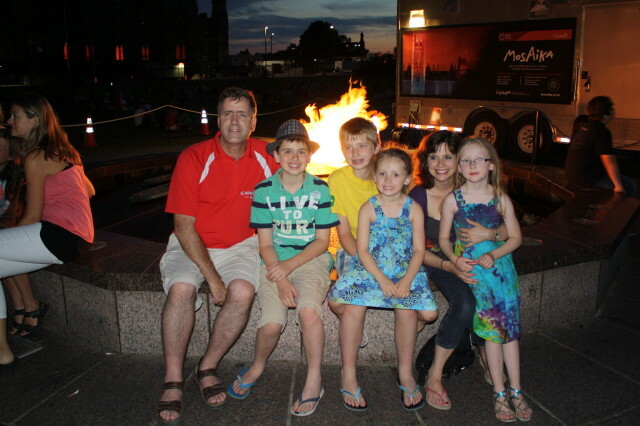 I lived in Quebec City 20 years ago, taking summer French Immersion at l’Universite Laval. It’s one of my favourite cities in the world! 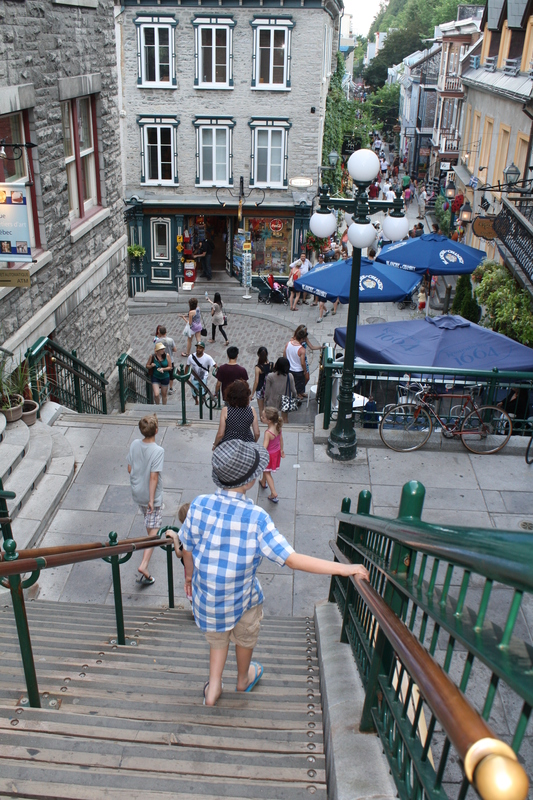 Before we arrived, I had imagined that we would stroll around Old Quebec, and stop at a pub for a leisurely lunch; Sarah & Evan would practice the French that they learn in school. Yes, in my mind, there were even accordions playing as I imagined this! In reality, everyone in my vehicle arrived in Quebec City hot, tired, and needing a bathroom. It just so happened that the Festival d’Ete (Summer Festival) was taking place so most streets were closed off and finding parking was a nightmare! We found a spot, found a bathroom, and then needed to find something to eat before everyone fell apart. 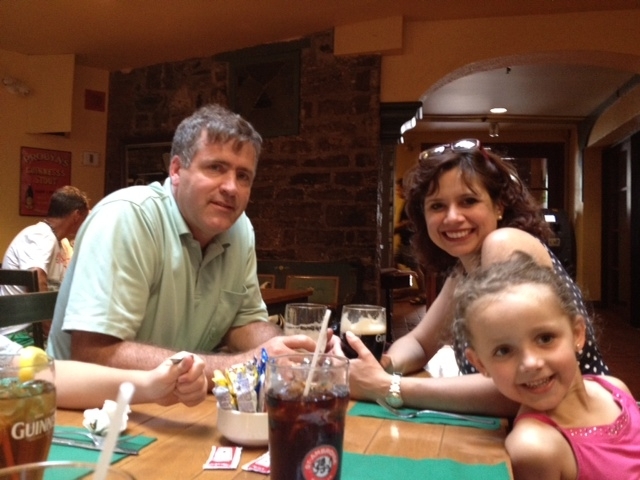 We ended up at St. Patrick’s Pub. 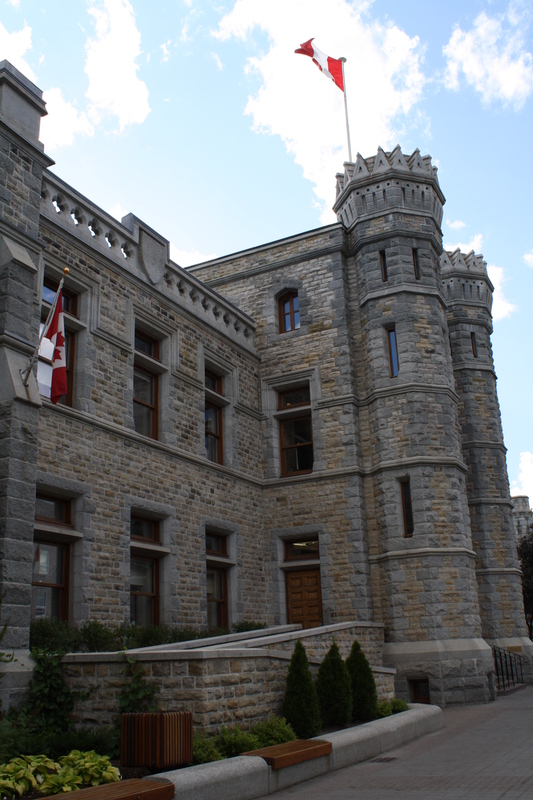 (In Quebec City, I know – not so French, and definitely no accordions!!) We ate inside because the patios of every single restaurant were packed! The food was okay, but our service wasn’t great. Our server took her break as they were putting up our meals, and not all of our food came at the same time. 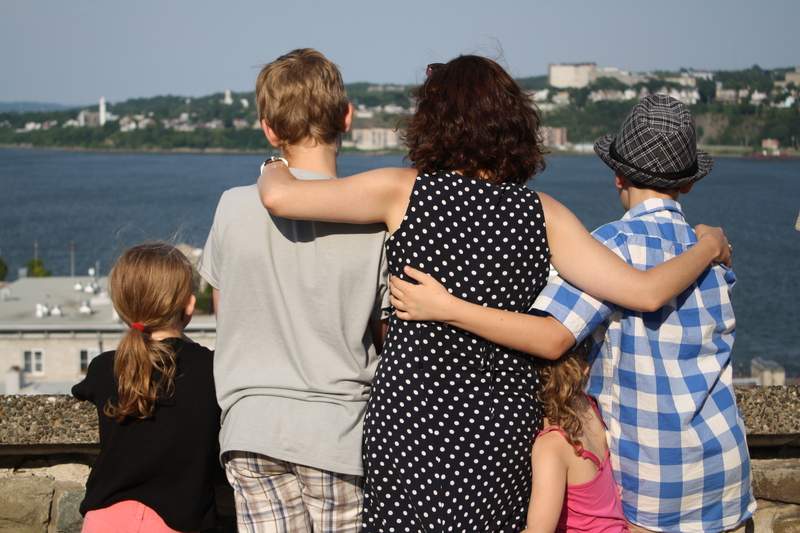 The touching moment before it all fell apart… We had been standing together looking out at the river when Olivia wedged herself between me & Alex. He wasn’t too happy about that! Our destination after Quebec City with friends who live on a beautiful farm, near Sherbrooke & Lennoxville, Quebec. (Home of Bishop’s University.) The drive from Quebec City to their house was three hours long. We’ve been using a GPS that D’Arcy’s brother Kevin lent to us, and it had generally been realy good. Par for the course, it chose this particular day to take us off the beaten path. D’Arcy & I each were having trouble remembering the road we were on. Parts would look familiar, and other parts we felt we were seeing for the first time. I was driving, and when we thought we were close, the GPS directed me to an old country farm lane that appeared to be rarely used. We ended up calling Scott and when he figured out where we were, he redirected us and we turned around. The last time we had seen Scott & Jennifer was when we stayed with them on a trip we took 13 years ago, when Evan was just six months old. 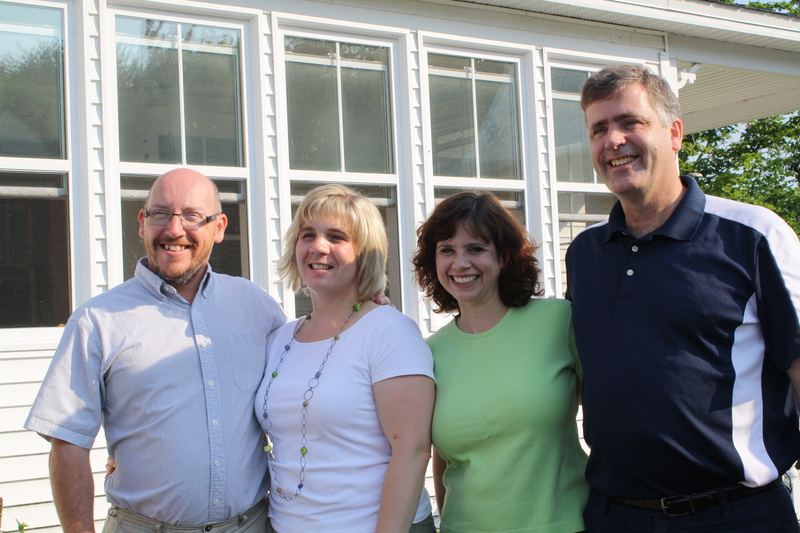 D’Arcy and Scott taught together at La Tuque High School in Quebec from 1990 – 1995. They have three beautiful children. Brittany is studying hospitality and is away from home this summer, working at a hotel in Gatineau. I was sorry we missed seeing her – I’m sure that she & I would have had lots to talk about! 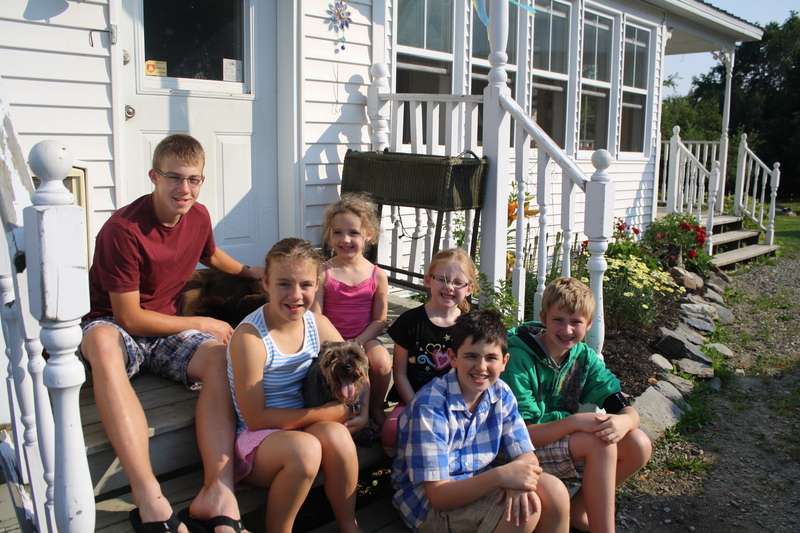 Nathaniel (16) and Brianna (11) were both home and made our kids feel right at home. They went off and played video games and coloured while the grown-ups sat around the kitchen table talking. Jennifer & Brianna both live a gluten-free lifestyle, so they understood the inconvenience of trying to feed Olivia on the road. I was so touched and grateful that Jennifer had taken the time to make allergy-free muffins and cookies for Olivia. Not only did she have some for snack, but she had some and breakfast and finished them on the road! Thank you Jennifer! In addition to the family, their farm is also home to two dogs, two baby ducklings, a number of baby chicks, a rooster, many sheep, and a donkey. Olivia was in her glory! We had a lovely visit; we just wish it had been longer! 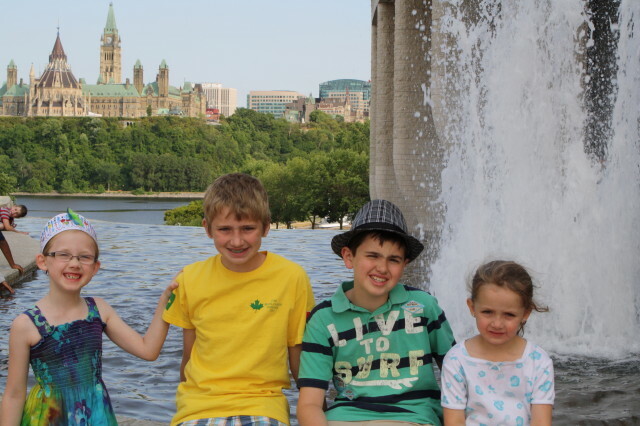 On our last full day in Ottawa, D’Arcy started marking at 7am because they were still behind – 16 teachers were trying to finish marking 1,000 Science Exams in four days… The kids & I had planned to go to the Canadian Museum of Nature after my cousin Chad had suggested it to us earlier in the week. My top Signature Strenth is “Input”, meaning that I love to collect information. 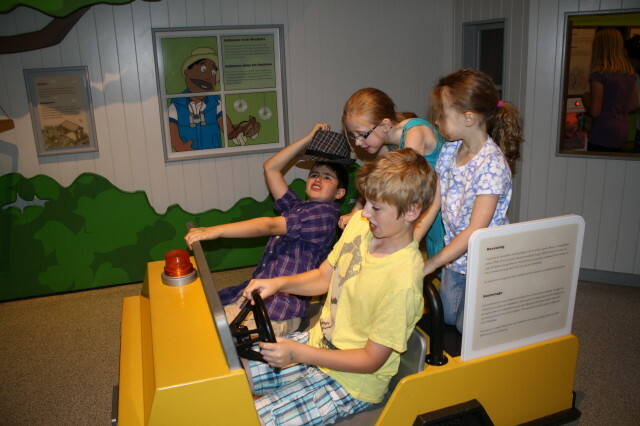 When we go to museums or participate in tours, I absorb as many facts as I can, and it would seem that my children have inherited this trait. It takes us a really long time to go through a museum – not because we dawdle, but because we participate and take in as much as we can. Kathleen was coming into the city anyway, so she dropped Evan & Alex off at the museum and Sarah, Olivia & I met them there. The temperature was forecast to be 36*C, so we were happy to be inside for the morning. 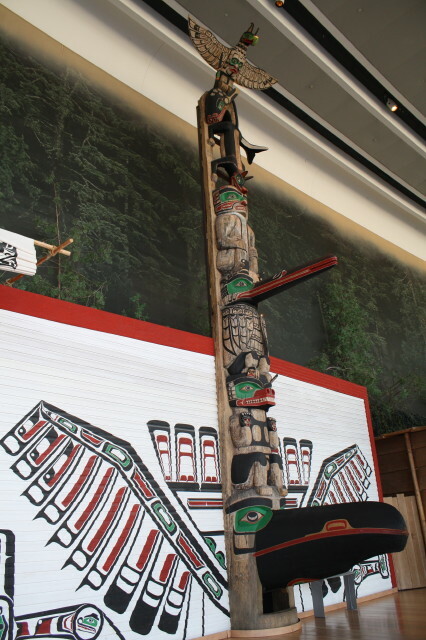 The Museum of Nature turned out to be one of the best museums that I have been to. We started out on the top floor in the “bird wing” and worked our way downstairs. There was just so much to see and do!! I felt guilty because I had made a lunch date with a childhood friend at 1:30 and we clearly were not going to be finished. Not wanting to miss anything, I suggested to the kids that we walk to meet Wendy for lunch and then come back to finish seeing the exhibits we hadn’t been to yet. They readily agreed! 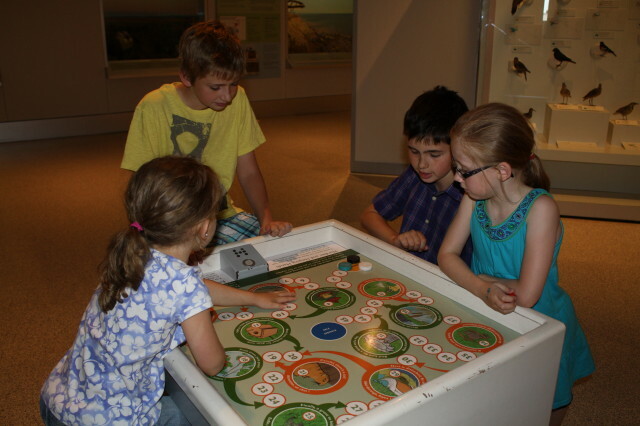 The kids play a board game about birds and their habitats. 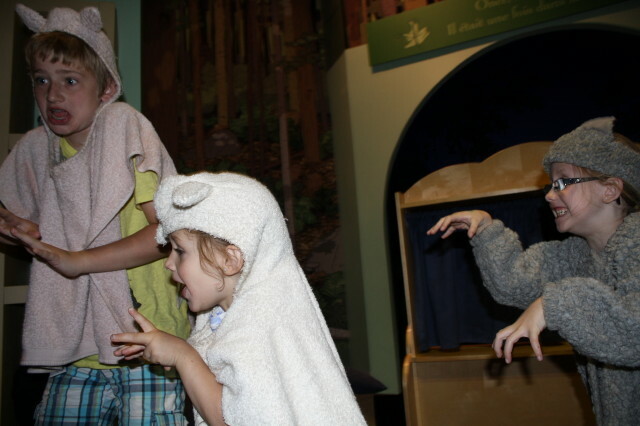 The Big, Bad Wolf chases two of the three little pigs in play area of the Mammal Gallery at the Museum of Nature. 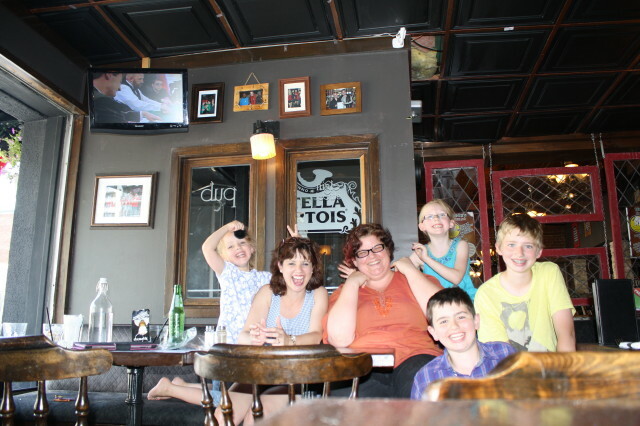 Our lunch with Wendy at “Woody’s Elgin Street Urban Pub” was a highlight of our trip! Wendy & I first met years ago in the Truro Music Festival, where we were always in the same piano sight reading class, among others. We were also at high school at the same time, although she was a grade behind me. Through the wonders of Facebook, we have rekindled our friendship and were happy to meet up. It was as if no time had passed at all, and as if my children had known her forever. Wendy is a professional musician and currently playing in the pit orchestra for Ottawa’s Broadway production of “Wicked” at the National Arts Centre. There was no shortage of conversation, nor laughter, and the afternoon flew by. She presented the kids with a CD of music from the Broadway production of “You’re a Good Man, Charlie Brown”. They were especially thrilled because Olivia, Sarah & Alex had sung “Happiness” as a trio together in the Truro Music Festival this Year, and Alex had been Snoopy for his musical theatre solo. Having fun with Wendy at the Pub. We had hugs, and she went off on her way, and we walked back to the museum to see the bottom two floors. At suppertime, we were finished and drove to the hotel to pick D’Arcy up. 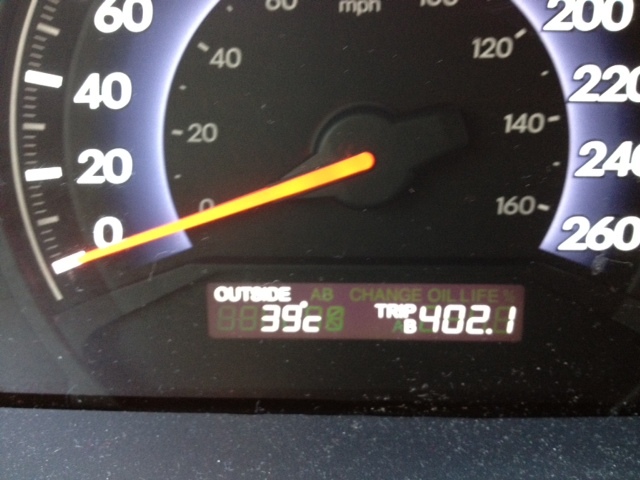 When we got into the van, it was measuring the outside temperature as 39*C – Brazil temperatures!! D’Arcy had finished about a half hour before we arrived for him, so had crossed the street to find a geo-cache at the Museum of Civilization. 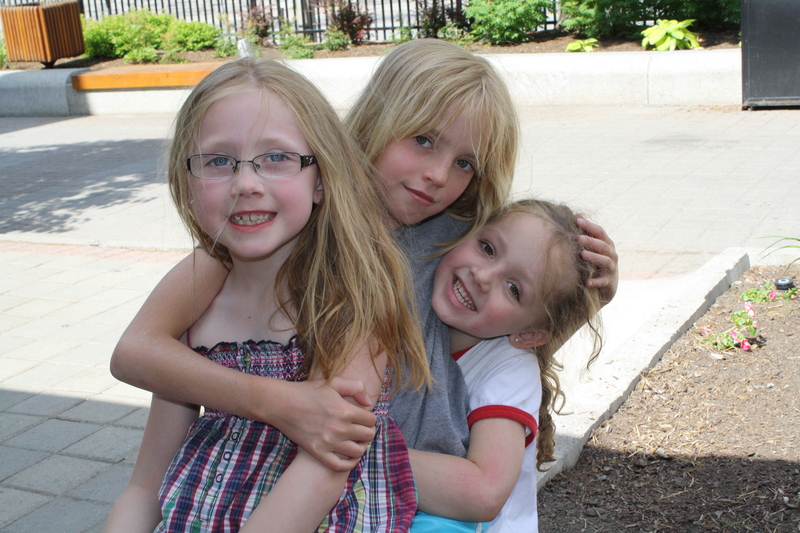 It was the first time three of our children had ever been in heat this temperature! 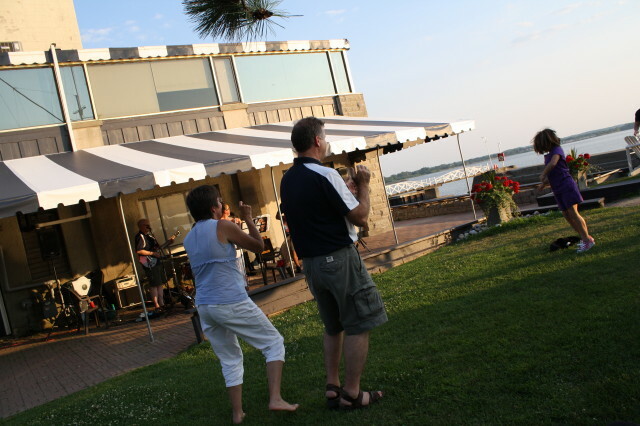 We all drove together to Britannia Yacht Club to meet up with Kathleen, Bill & the cousins. We went swimming, had dinner, and listened to the band. Kathleen even got D’Arcy up and dancing at one point. Reilly was fishing, William & Evan putted around in a boat, and the girls played on the playground & with the dogs that were there. 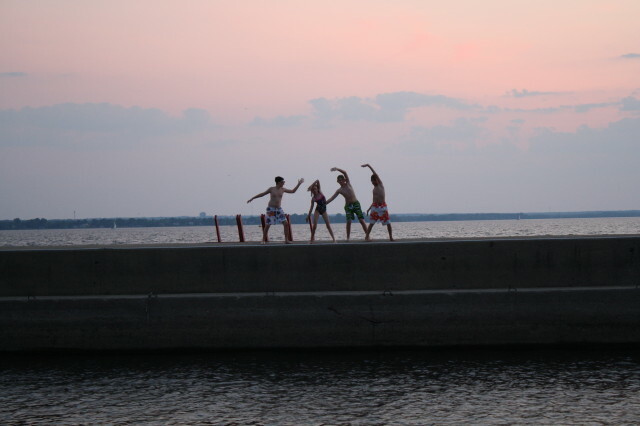 The cousins went swimming at dusk and all jumped off the pier together. It was a magical final evening together. They can really cut a rug – er, a lawn! 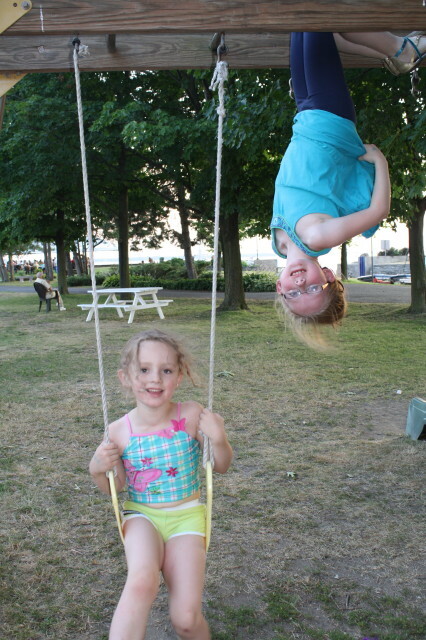 Girls at the playground – this favourite position is why Sarah always wears shorts or leggings under her dresses! 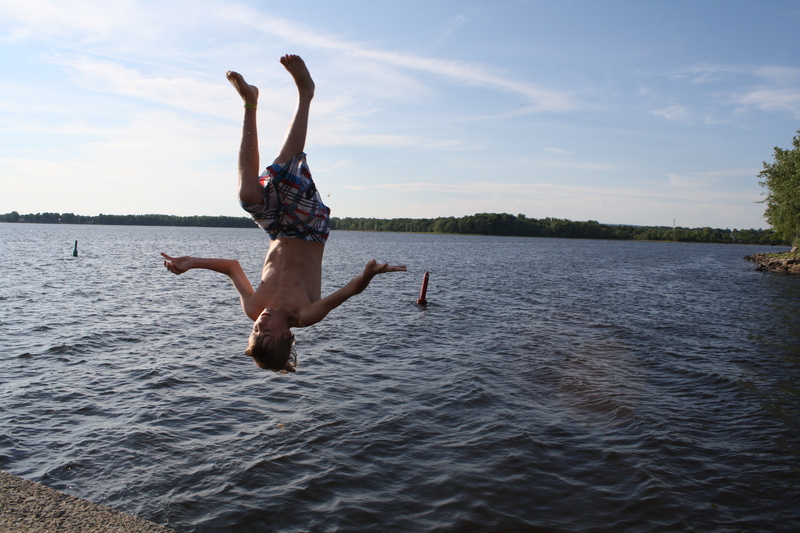 * This post was written while we were on vacation from July 1st – 15th. We are now back home and welcoming guests. 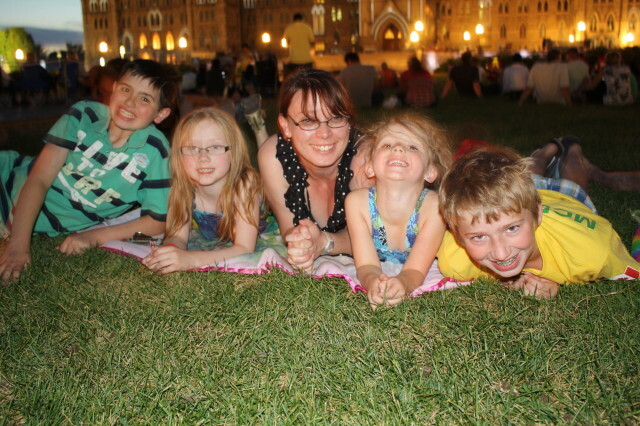 On our third day in Ottawa, the girls were exhausted and I encouraged them to sleep in as I knew because of our plans, that they would be having another late night. I did some work in the hotel room until they woke up, then we went to the grocery store to pick up a few things and headed to Kathleen’s for lunch. After we all ate and played, Evan, Alex, Sarah & I went to the Canadian Museum of Civilization for the afternoon, which was located directly across the street from our hotel. 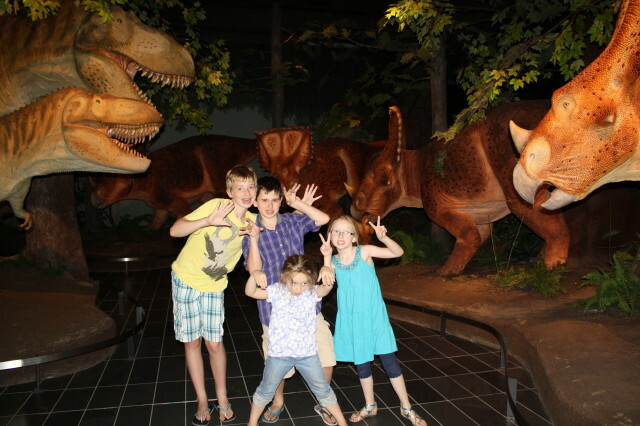 The museum was very interesting and has a 3-D IMAX theatre located within. We were able to get a combo pass, and went to see the movie, “To the Arctic”. None of us had ever been to see an IMAX before. (In fact, Olivia’s first movie in a theatre was only last year because of the risk of allergic reaction from all the food and candy people eat while watching.) 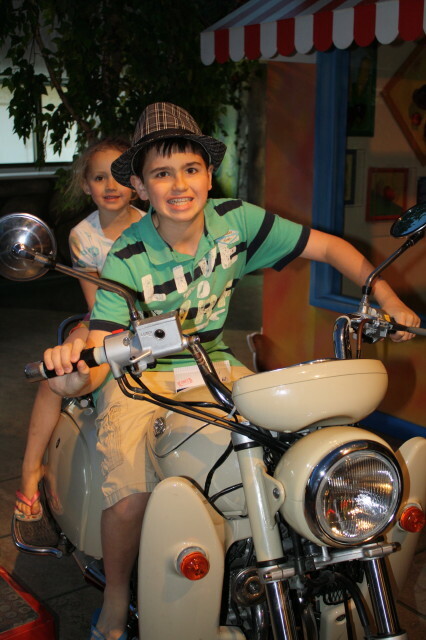 Alex has impaired vision and normally only uses his left eye to see. As a result, he doesn’t have depth perception, making it difficult to see in 3D. His eye surgeon had told us a few years ago that there was a chance with really large movie experiences; he might be able to see 3D. He sat down for the movie and looked a bit dejected. I told him to at least try the glasses to see what would happen; that perhaps they would at least take away the blur. He put them on and I could tell by the expression on his face that he was seeing the 3D for the first time. (We all were, for that matter – pretty neat!) What an experience! After the movie was over, we continued to explore the museum. 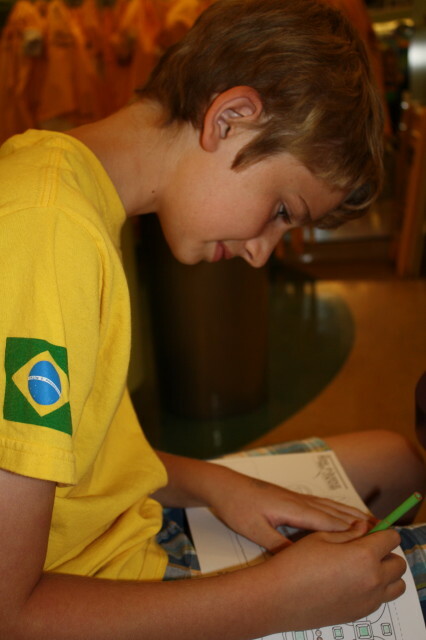 There is a whole wing devoted to children, where they are given passports to stamp and participate in interactive activities. 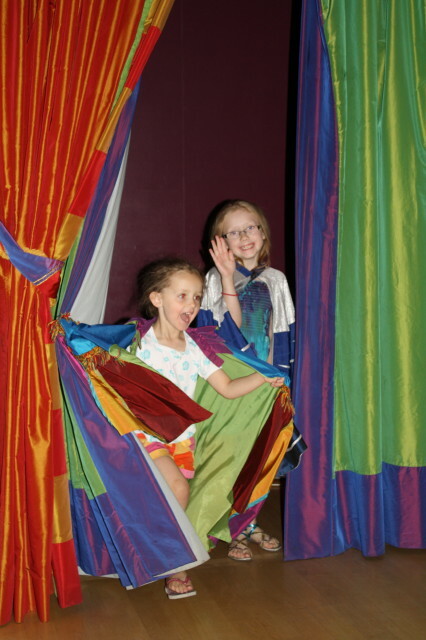 They had a fabulous time, using their imaginations and playing. 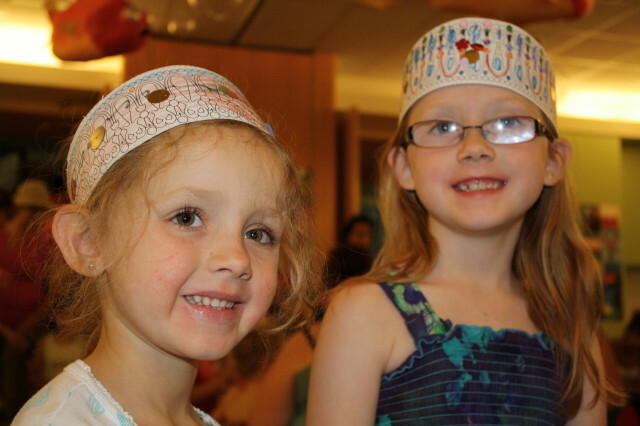 At one station, they each made a craft – a crown to wear. Olivia was in stimulation overload and wanted to run from one thing to the next. 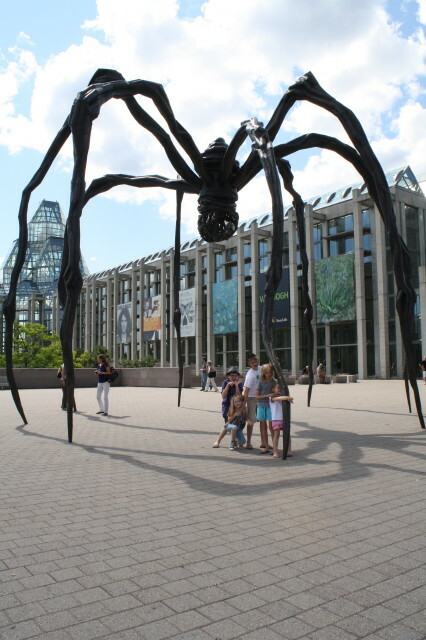 However, museums are free in Ottawa on Thursdays, so this area was packed with busy children and I was afraid of losing her. Finally, I told her she was done, and she had to stay with me while Evan & Sarah went and collected the rest of their stamps. To rub salt in the wound, she had lost her crown when she was running to the different exhibits and there were so many kids, we couldn’t find it. Big brother Evan came to the rescue and gave her his. 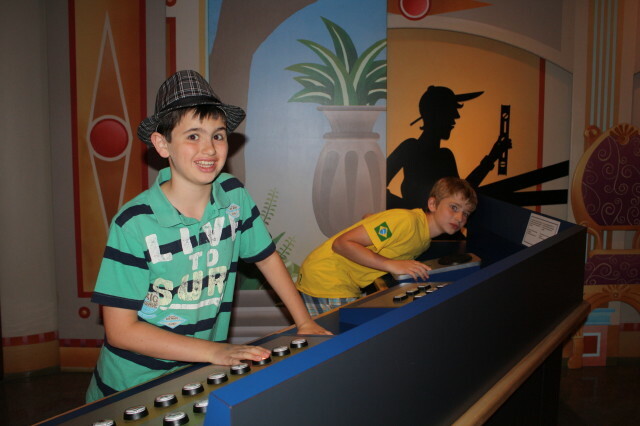 Alex & Evan produce sound and lighting for their sisters’ stage show in the Children’s Theatre. The Sarah & Olivia Improv! Evan, crafting his crown – this would later come in handy!! This was the beginning of a series of funny photos in various transportation. Shades of years to come? We went over to the hotel to meet D’Arcy. They were behind on their marking, so he had been working overtime. We had plans to meet my cousin, Chad, and his girlfriend, Koren, for dinner at a place along the Rideau Canal called the “Canal Ritz”. It was a beautiful restaurant, and we ate outside under the awning. The food was amazing and it was fun to get caught up with them. For dessert, Koren & I had a “milkshake” made with Drambuie, Bailey’s and Kahlua that I need to learn to re-create for our next dinner party!! I was especially impressed that the server offered Olivia a scoop of Chapman’s Ice Cream for dessert – peanut & egg free! It was Olivia’s first-ever dessert in a restaurant! 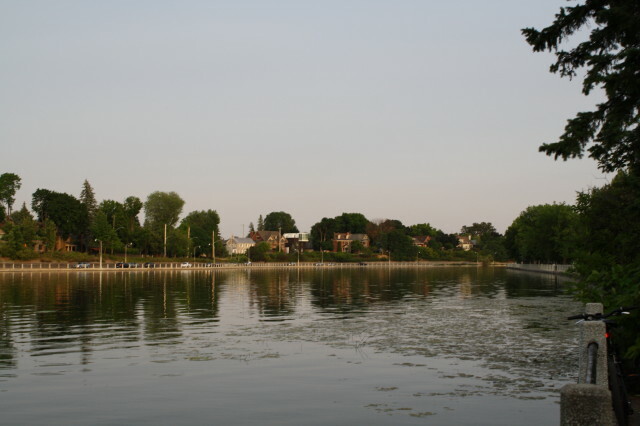 After supper, we walked along the Rideau Canal. 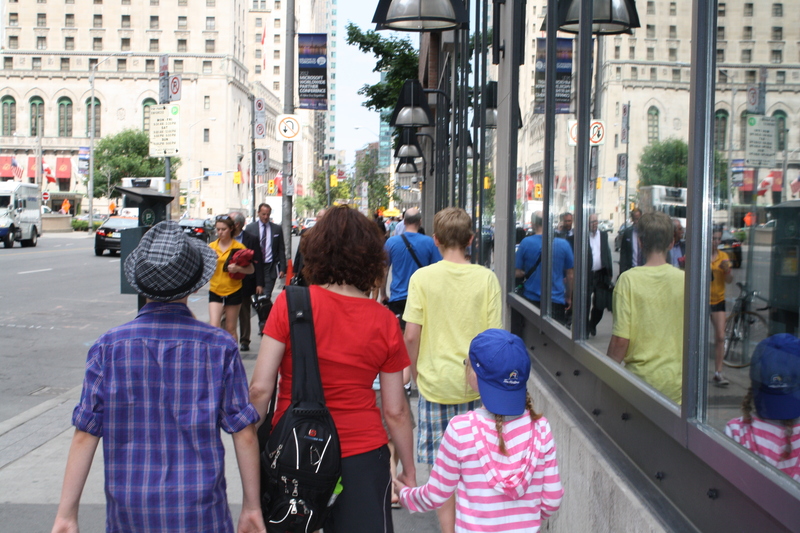 Ottawa is a very walkable/bikeable city. D’Arcy & I remarked a few times about how nice it was to see so many people out exercising at all times of day. 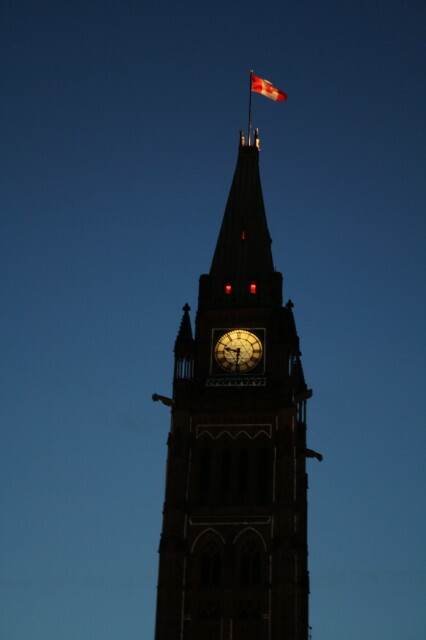 The Peace Tower – so beautiful! 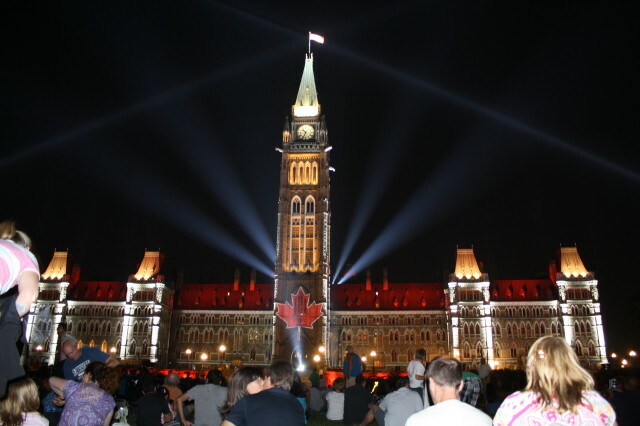 If you are in the Ottawa, we highly recommend this experience. It is very well done and lasts for about 45 minutes. We walked back to our vehicles, said our goodbyes, and we took Evan & Alex back to their cousins’ house before coming back to the hotel for the night. 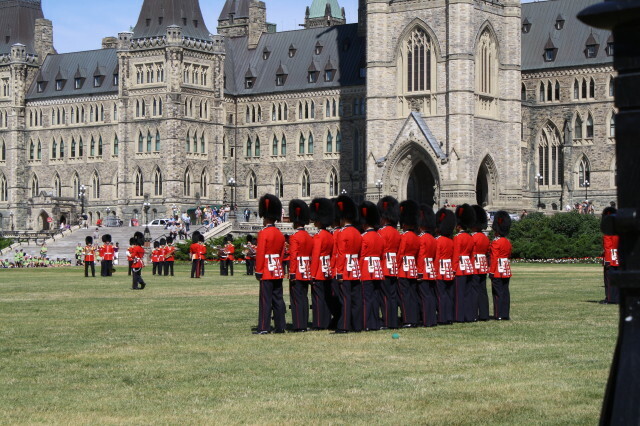 On our second day in the Ottawa area, we got up early, we had breakfast, and then the girls & I walked the 2km across the Ottawa River to Parliament Hill and met up with Evan, Alex, Kathleen & Erin to watch the Changing of the Guards. The ceremony lasts 45 minutes and is very beautiful to watch and listen to. There were bagpipes and a military band. The girls were lucky to get a spot when they could sit on the grass at the edge of the lawn, so they had a perfect vantage point. 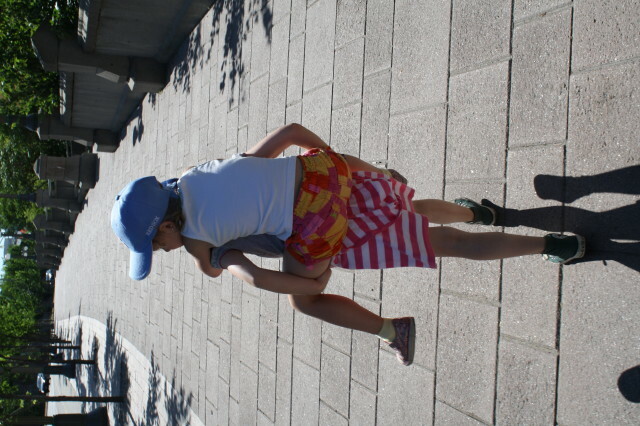 When it’s hot, and you have to walk 2km, it’s nice to have a sister who will give you a lift! 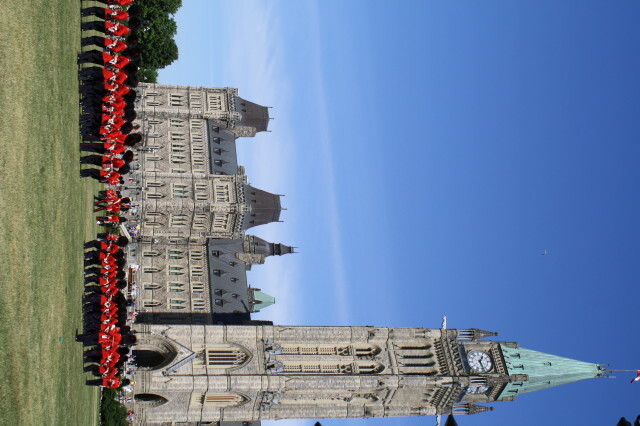 The beautiful Changing of the Guard Ceremony on Parliament Hill in Ottawa. No matter what your feelings are of our country’s political system, we are fortunate to live in a country where we have a say. It was a very special feeling to be surrounded by so much history! 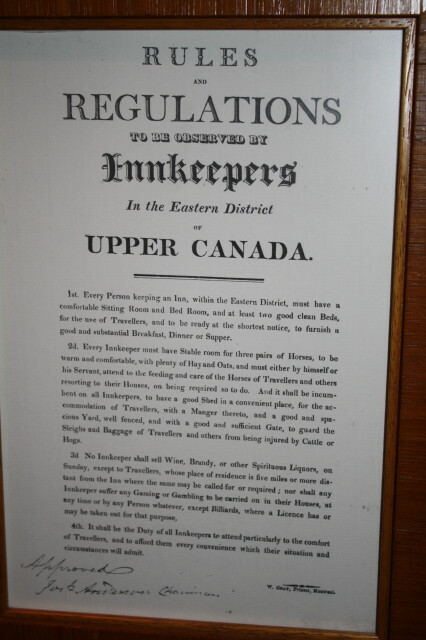 We spent an hour or more touring the grounds of Parliament Hill, looking at statues, and searching for stray cats. 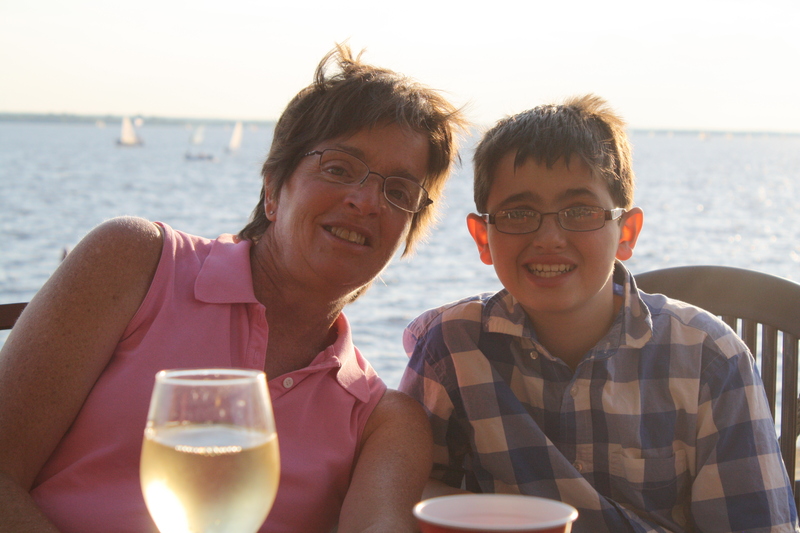 We climbed down a set of stairs to the Ottawa River and walked along it a little way before stopping for a drink. We could see the bridge we had walked over. The temperature was in the 30’s the whole time we were in Ottawa, so it was important to stay hydrated. Before going back up the stairs, we took guesses on how many there were. The total? 262 – Alex’s guess!! Evan had climbed 51 stairs when Olivia decided he wasn’t counting properly and made him go back down and start over. Being a good sport – and in good shape – he humoured her and did it! The bridge Sarah, Olivia & I had walked across to get from our hotel to Parliament Hill. 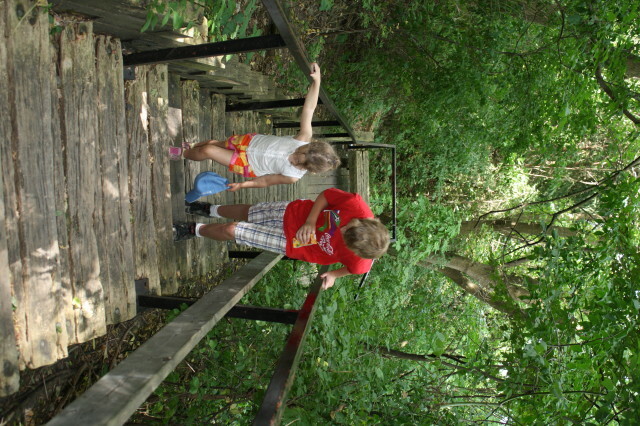 Evan & Olivia climb the 262 stairs back to Parliament Hill from the Ottawa River. 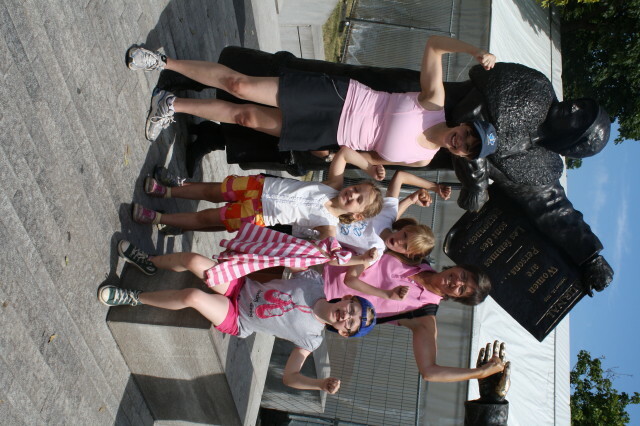 We stopped at the monument commemorating Women in Canada earning the right to vote and had a “Girl Power” photo taken! 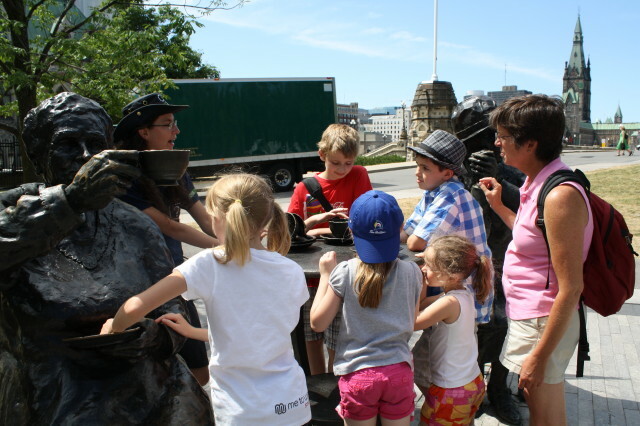 We all learn the history of women winning the right to vote in Canada from a heritage interpreter. 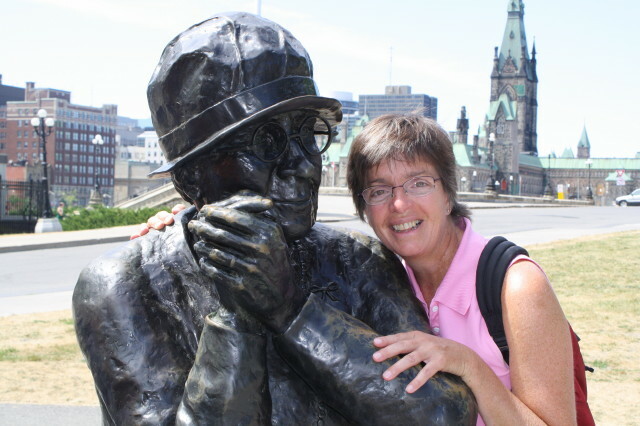 Kathleen finds a long-lost relative! 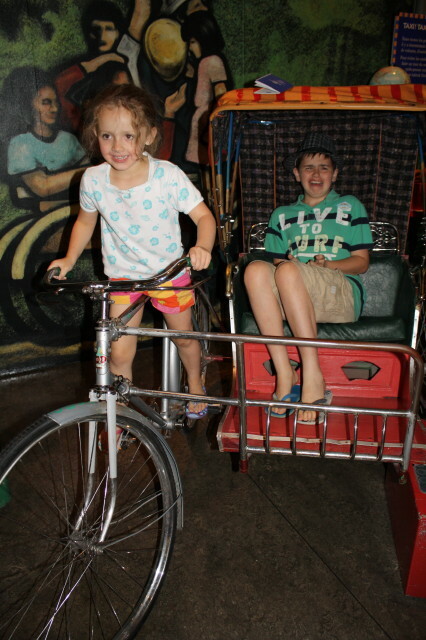 We headed downtown to find a restaurant to have lunch and stopped at “The Fish Market”, near the National Art Gallery. 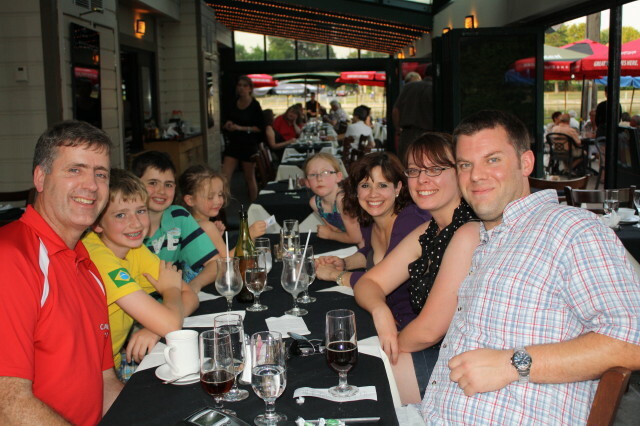 It was a lovely meal – Sarah had a plate of fries, Erin had a cheese pizza, Alex & Kathleen had fish & chips, Olivia & I shared a garlic shrimp & scallop with rice and veggies entrée, and Evan had lobster poutine. 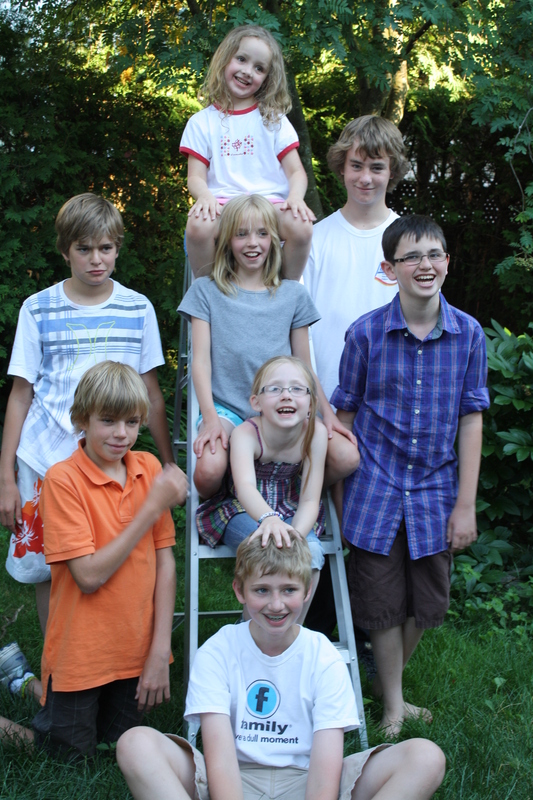 They were very good at accommodating five children and food allergies! After lunch, we walked to the National Art Gallery to visit the Van Gogh exhibit. 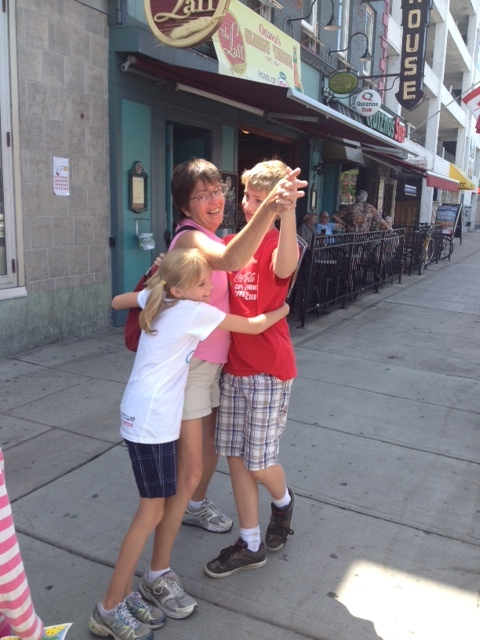 Along the way were many street musicians, and Kathleen grabbed Evan for an impromptu dance. Under the sculpture outside of the Art Gallery. Sarah was NOT impressed to be posing with a giant spider!! 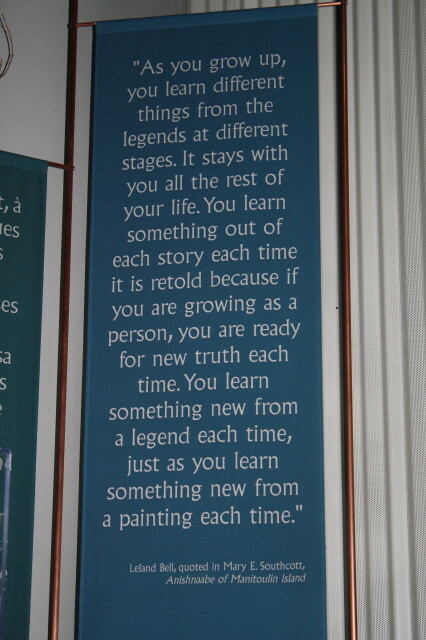 The Van Gogh exhibit at the art gallery was really interesting, and the paintings were beautiful. The art was above the children’s heads until we got to an interactive part of the exhibit where they were able to put together puzzles of his paintings on the wall, make artwork of their own which would be displayed at the museum, and send letters to Vincent Van Gogh. Olivia wrote, “ Dear Vincent, When I looked at your paintings today, I loved your paintings and I wish I could paint like you. Love, Olivia, age 5”. The gallery responded, sending her an email the following day with an excerpt from one of Vincent Van Gogh’s own letters, saying: “…the love of art makes us lose real love. I find that terribly true, but on the other hand real love puts you right off art. And sometimes I already feel old and broken, but still sufficiently in love to stop me being enthusiastic about painting.” Perhaps over her head! Erin wasn’t feeling well, so Evan & Alex left from the Art Gallery with Kathleen while the girls and I walked back over the bridge to our hotel. 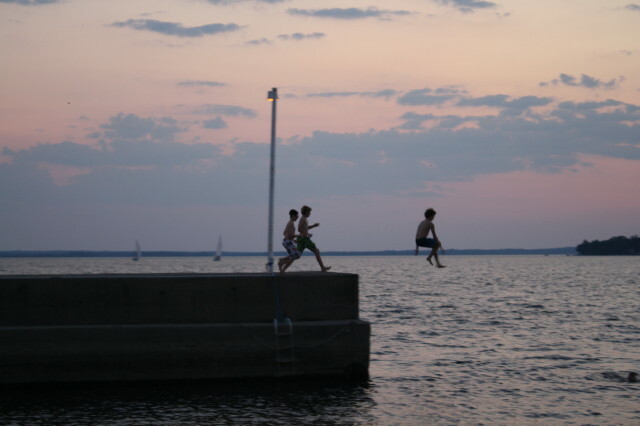 We met up with D’Arcy and then we all went to the Britannia Yacht Club for dinner and an evening of swimming, fishing, jumping, and monkey bars. 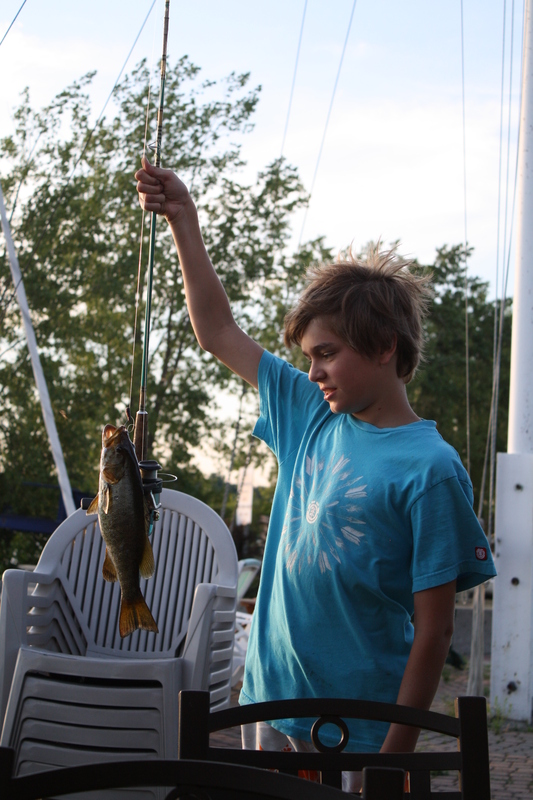 Alex caught and released a small mouth bass. The adults had fun just talking, eating, having some wine, and watching the cousins play together. The future vets with Coco the dog. 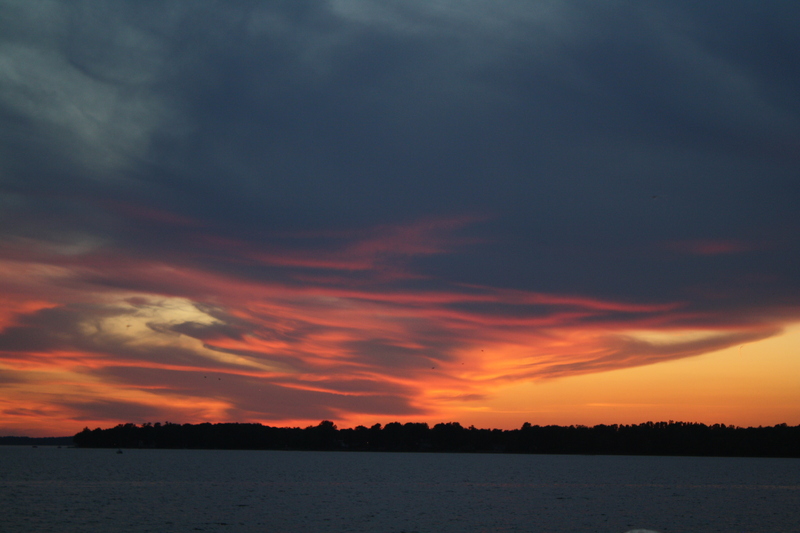 A beautiful sunset to end a wonderful day! 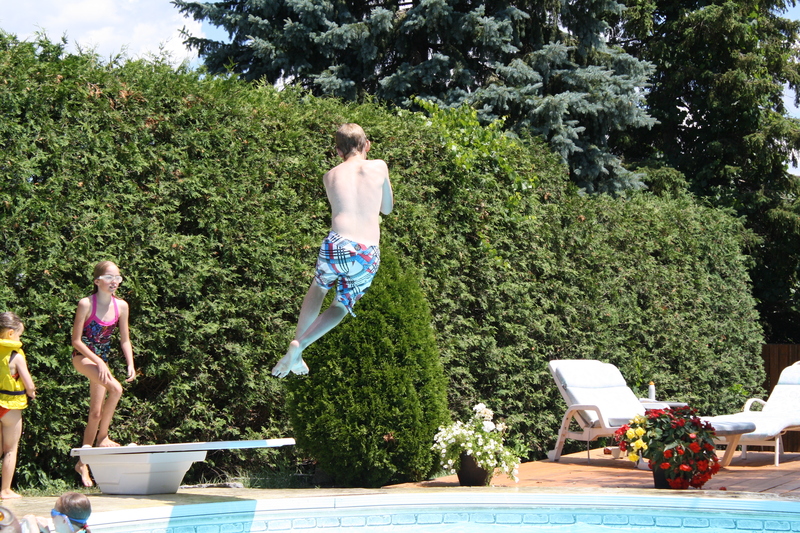 In mid-June, right around the time I found out I would be returning to Cornell, D’Arcy learned that he had been chosen as the Nova Scotia representative to mark the PCAP Assessments, a Science Exam written by Grade 9 students across the country. He was scheduled to be marking from Tuesday – Friday from 8:30 – 4:30 daily. 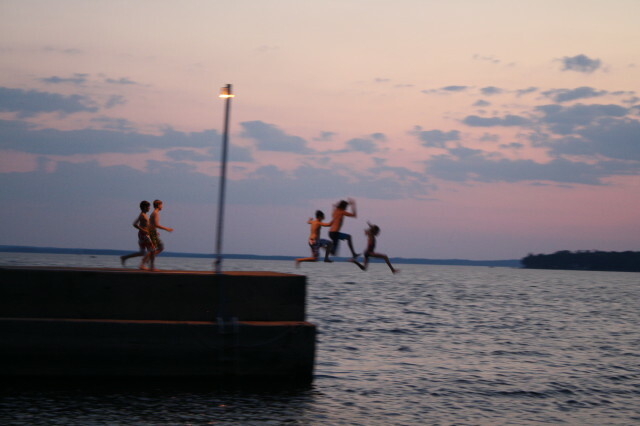 This meant that the kids & I would be having some adventures on our own for the week. 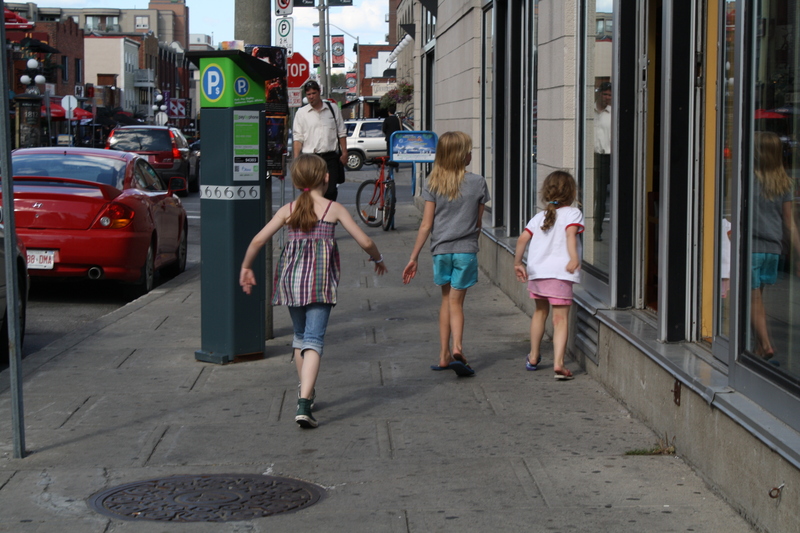 The first morning we were in Ottawa, after D’Arcy left for work, the girls & I were moving slowly. 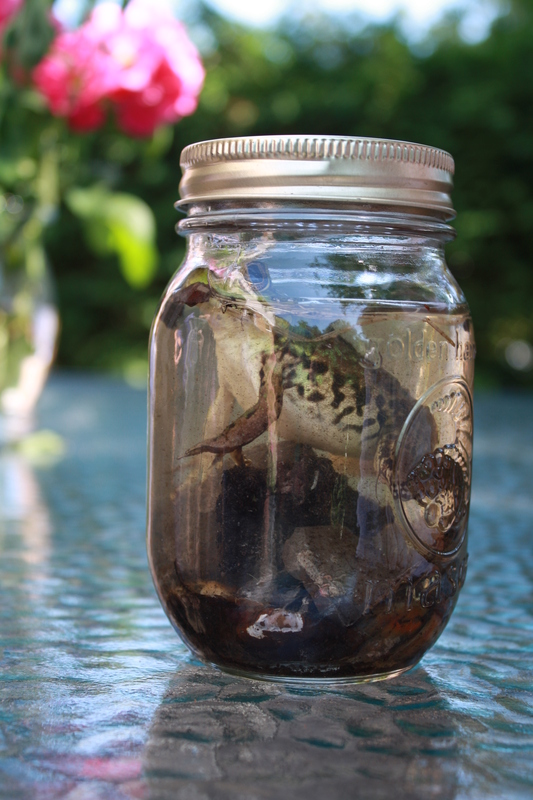 We drove back to Kanata, and when we got to Kathleen’s, we discovered that Evan, Alex, Reilly & Erin had caught a frog in a nearby pond. 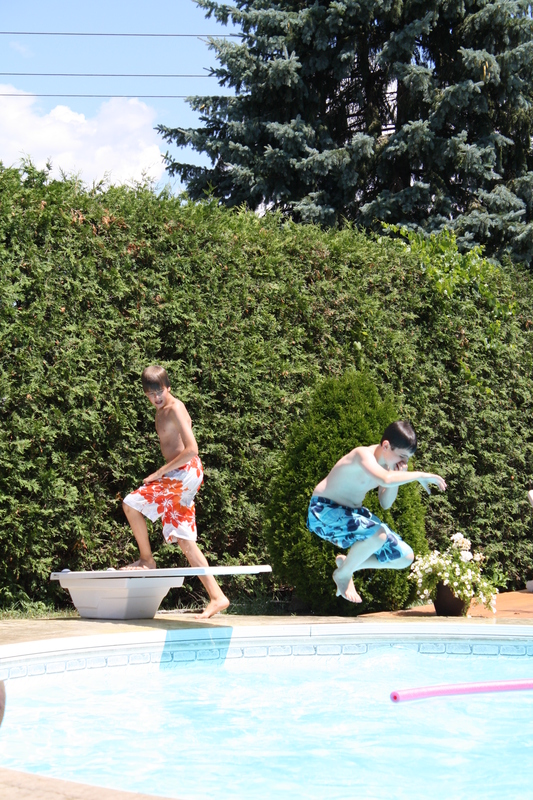 Kathleen suggested a swim in their next-door-neighbour’s pool, so the cousins shared their bathing suits, and everyone had a fun morning staying cool in the 36*C+ temperatures. 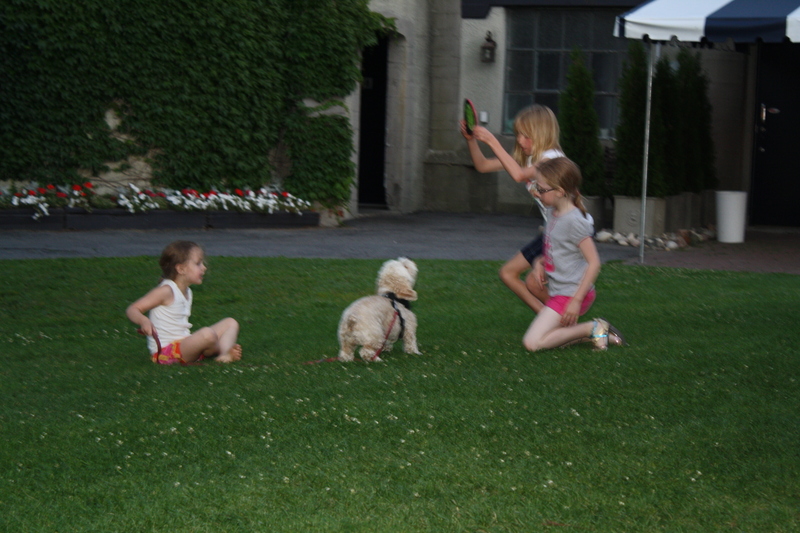 The neighbours also had a sweet dog, Bailey, so Olivia was in her glory playing with him. 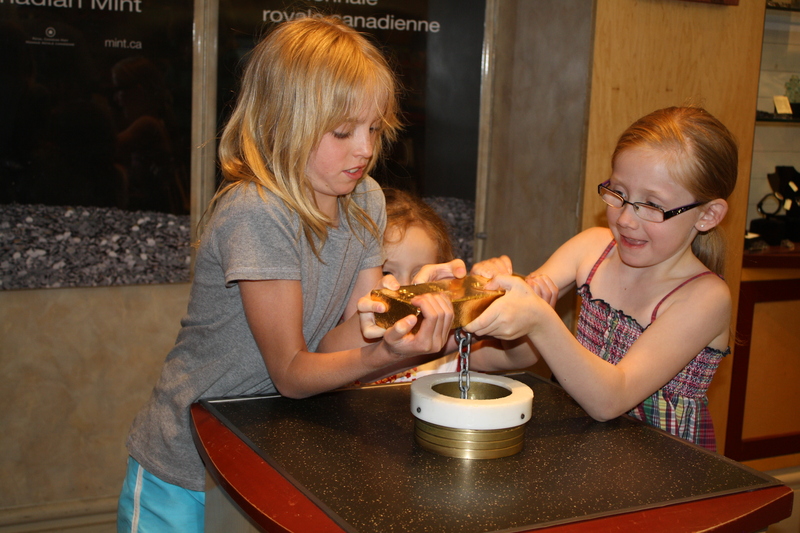 We made sandwiches for lunch, and then I took Evan, Alex, Sarah, Olivia and Erin in to Ottawa to take a tour of the Royal Canadian Mint. “Percy Jim McDonah” – the frog. “He was released back into the “wild” shortly after this was taken. The Canadian Mint makes commemorative and investment coins, as opposed to circulation coins. I was amazed by how much trivia Alex knew about the history of our currency. Things like the fact that since 2006, the cast of the Queen on the back of all of our coins no longer has her wearing a crown. Apparently she made this choice because she wants to appear closer to the people. 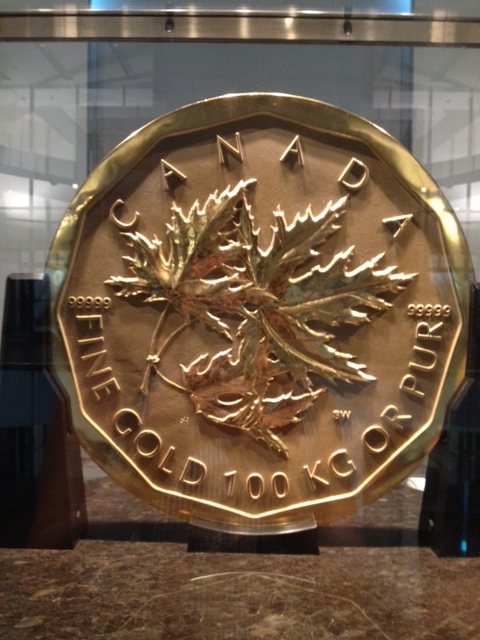 We learned that Canada holds the record for producing the purest gold coin in the world. At 99.999% pure, the $1,000,000 face value coin is 52 cm in diameter and 3 inches thick. There were only five of them made, and they feature a maple leaf design. The monetary value of each is now over $6.2M. The solid gold $1M coin we learned about. One of the five is in Saudi Arabia and has been turned into a coffee table by its owner. After we finished our tour of the Mint, we went to the hotel to pick up D’Arcy and then we all went back to Kathleen & Bill’s for a barbeque. We had steak, potatoes, salad, and corn-on-the-cob with ice cream sandwiches for dessert. 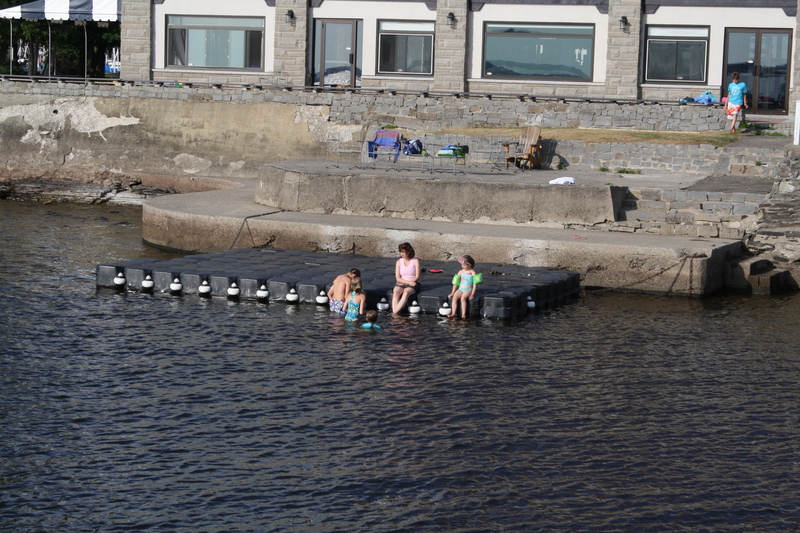 The kids played hide-and-seek, went to the nearby playground and hung out. It was a really great evening. 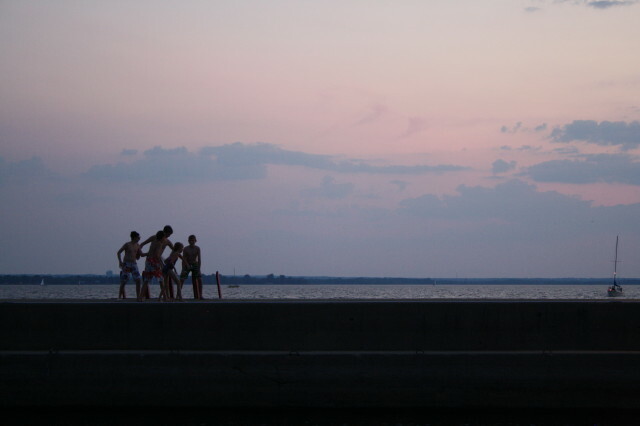 *This post was written while we were traveling from July 1st – 15th. We are now back home and are welcoming guests. 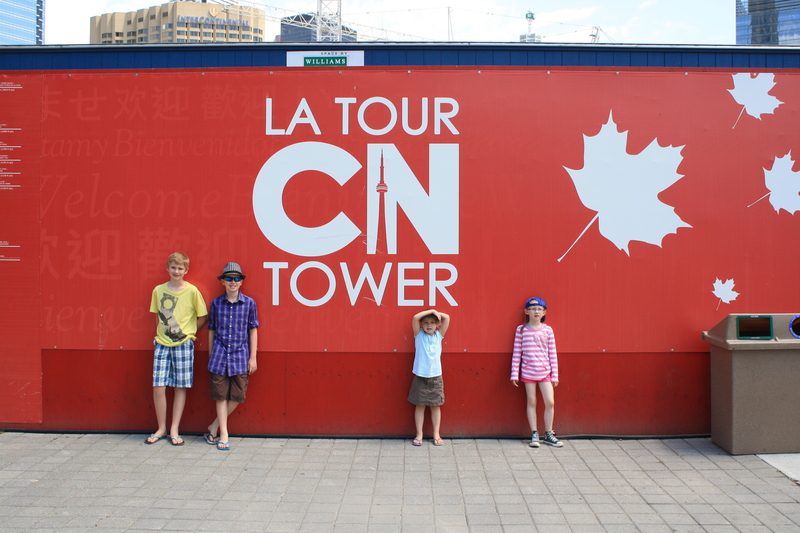 We had to be in Ottawa on Monday night, but we really wanted to take a tour of the CN Tower in Toronto while we were so close. 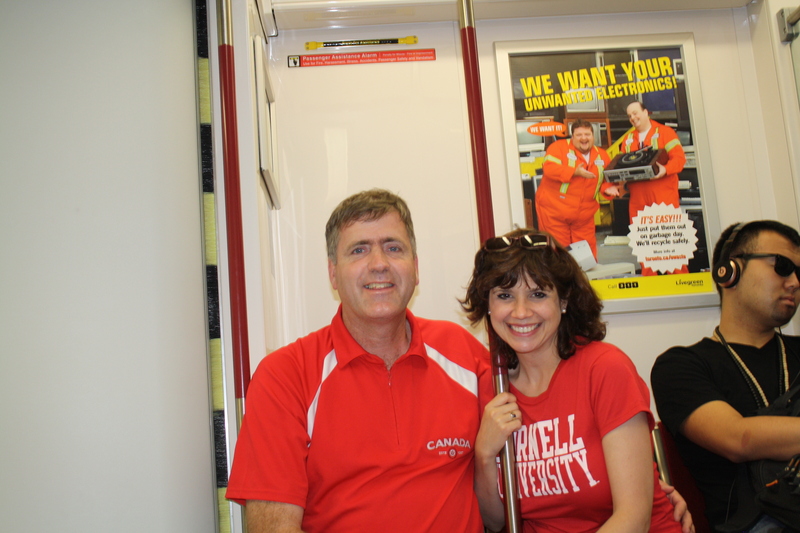 We drove from our hotel in Vaughn to the Yorkdale Mall, and took the subway from Yorkdale to Union Station. 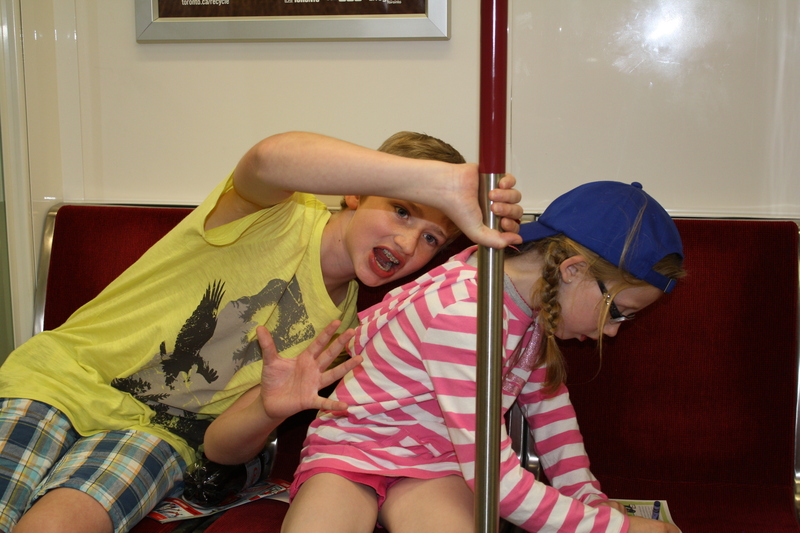 The kids love the subway and the girls find it a real treat to stand up and hold on to the poles while the train is moving. Luckily, we weren’t traveling at rush hour, so it wasn’t a problem for them to do this. 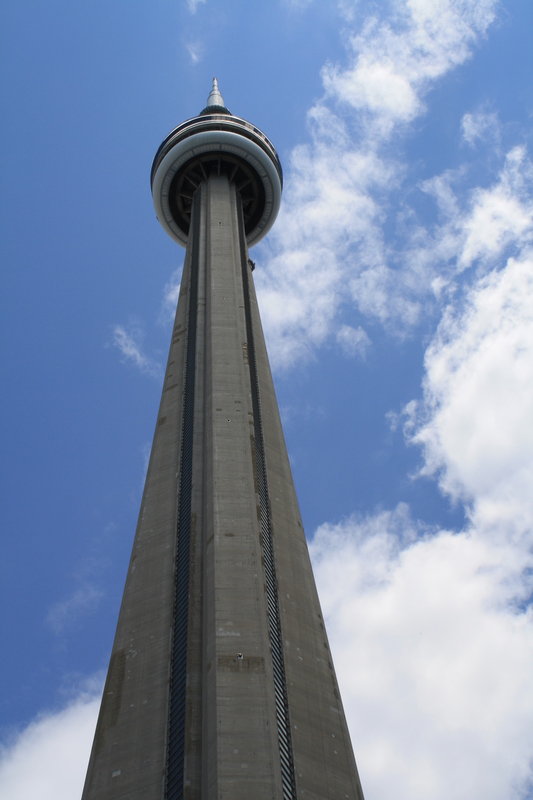 Once we got downtown, we walked to the CN Tower and bought our tickets to take the elevator the 351 metres (1,151 feet) up to the observation deck. 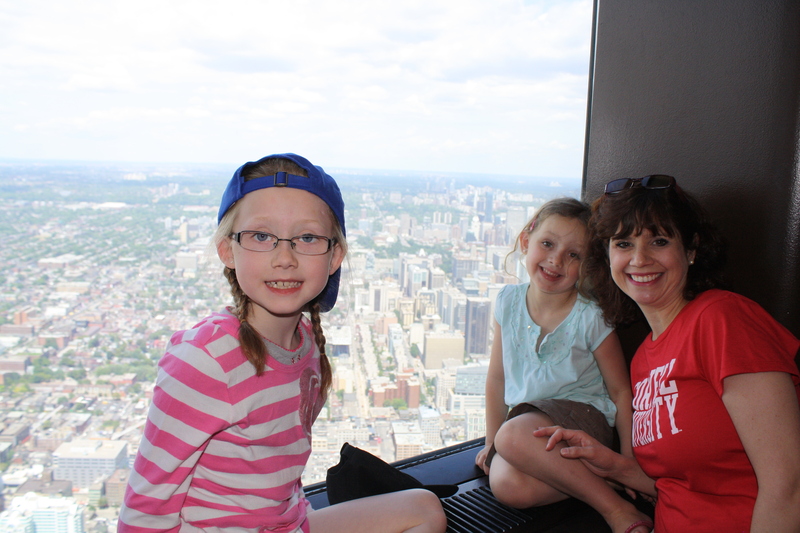 The views of Toronto are amazing from up there! Waiting to get our tickets. I don’t really like heights, but I did enjoy the experience despite the feeling in my stomach! 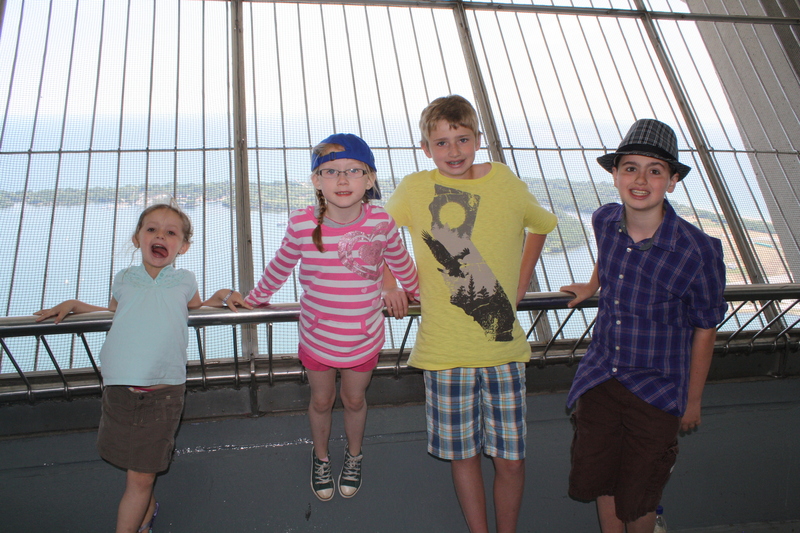 The kids – especially the boys – had a lot of fun seeing what they could spot from way up there! 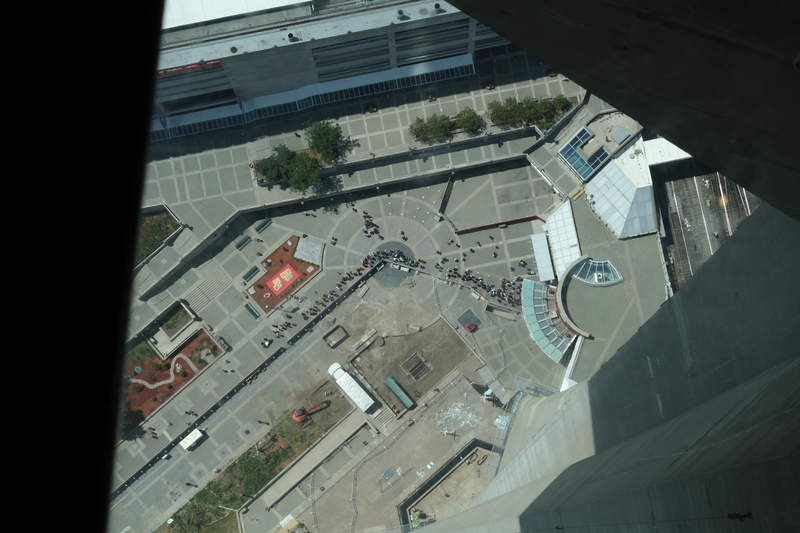 We were directly above the CBC Broadcasting building, so I took a photo of it and “tweeted” to Jeff Douglas, Co-host of CBC’s “As It Happens”, cast of “Mudpit”, and childhood friend, that we were waving to him. It was only a few moments later when he tweeted a photo of himself waving back to us! The kids were tickled. 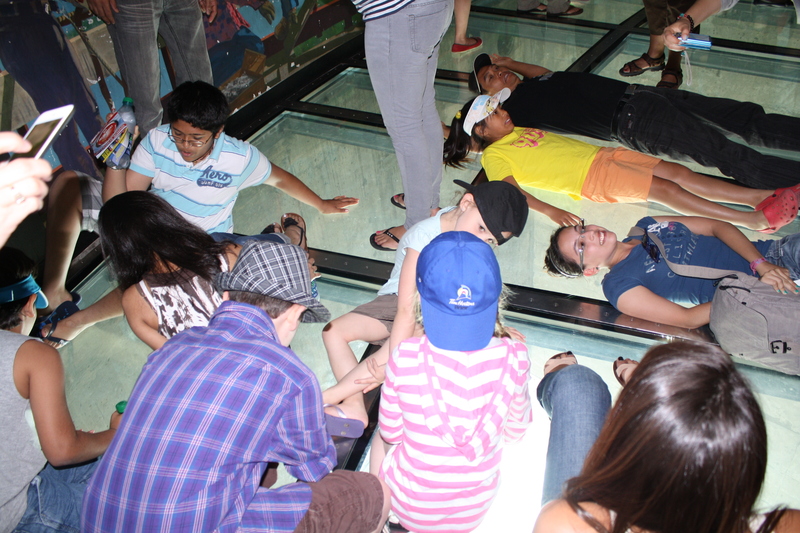 We watched the “Skywalkers” who were hanging off the outside of the Tower via webcam, and spent some time walking, lying, and sitting on the glass floor. I have to admit, that definitely made my stomach turn – I doubt I could do the Grand Canyon Skywalk. 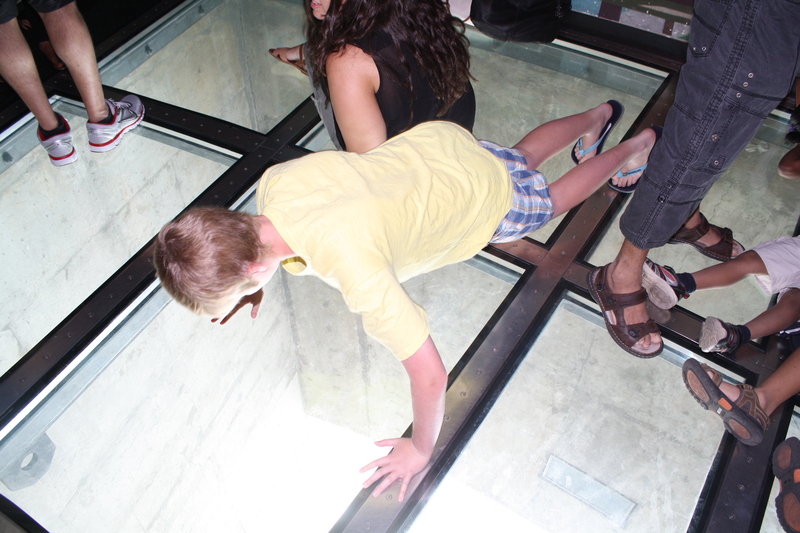 Evan, doing some push-ups on the glass floor – this photo is for his Phys. Ed. teacher! After we descended, we made our way to Boston Pizza for a late lunch/early supper before taking the subway back to our van. It was a four hour drive from Toronto to Otawa and the traffic was not anything like we are used to! D’Arcy drove in the city, as he’s more confident driving in traffic than I am. Once we were out of the city, and we were down to just three lanes, I took over and drove while he studied his marking manual. 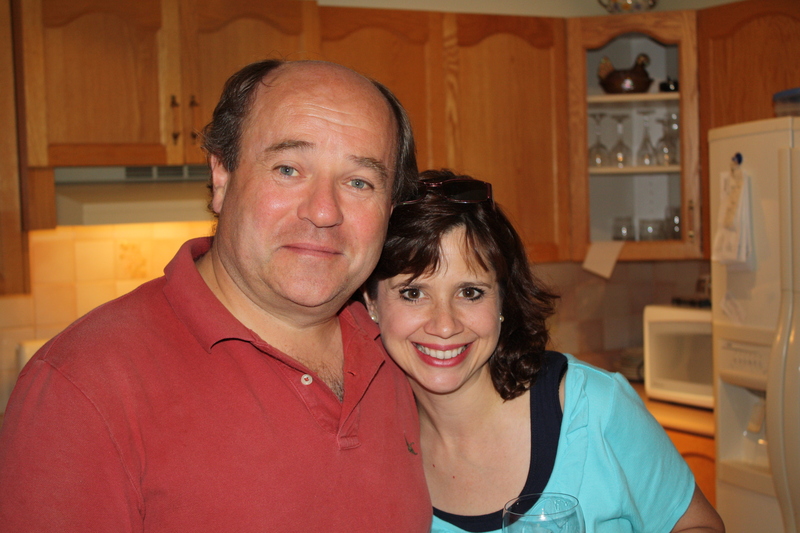 We arrived in Kanata at D’Arcy’s sister’s home right at 9:00 p.m. We had some tea and a glass of wine and got caught up with one another. 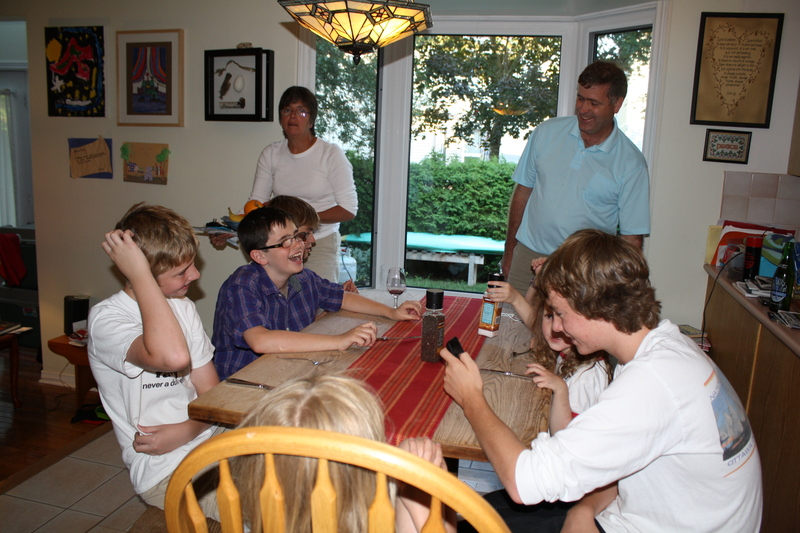 Kathleen & Bill have four children as well, and Evan & Alex had arranged to stay with them while we were in the Ottawa area. 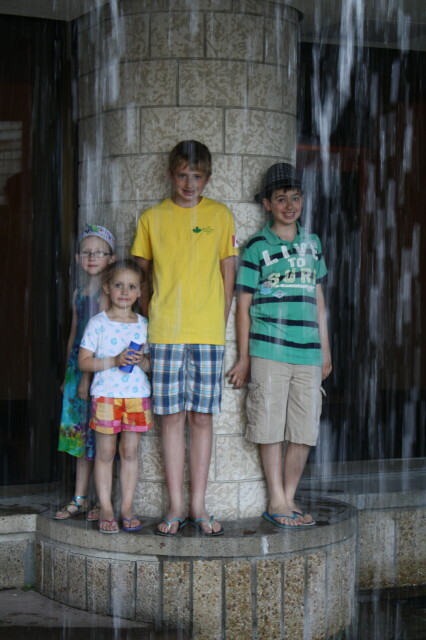 We left the boys with their cousins and drove with the girls to check into our hotel in Gatineau, Quebec, where D’Arcy was scheduled to work for the week. 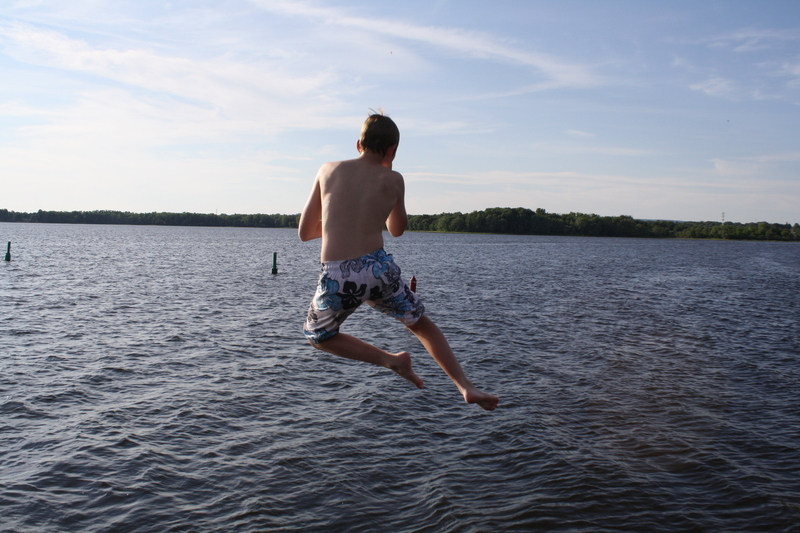 * This post was originally written while we were traveling from July 1st – 15th. We are now back home and welcoming guests!